Ever since Mark Scisly left coaching in the Lehigh Valley Conference back in 2004, he has always wanted to get back into the LVC. Scisly, who replaces Jeff Brosky (who resigned after last season), brings with him an impressive resume that he feels will serve him well. The Ursinus College and West Chester University graduate felt his first success on the gridiron in high school as a player at Southern Columbia Area High School where he was a four-year starter that played in three state championship games. He also was named to the A.P. All-State team three times. He went on to play at Ursinus College where again he was a four-year starter and in 1998 was named the Co-Offensive MVP of the team. His first coaching experience came right there at Ursinus as he coached the offensive line and tight ends from August of 2001 until March of 2003, which is when he made his impression on the LVC as the offensive line coach for Northampton for the 2003-04 season before getting his first head coaching position. He went on to coach the Salisbury Falcons from 2004 to January of 2008 where he really made a name for himself. Scisly is the program’s all-time leading coach for playoff victories and playoff appearances. He turned a program around that was winless and made them into Eastern Conference Champions in just three years. 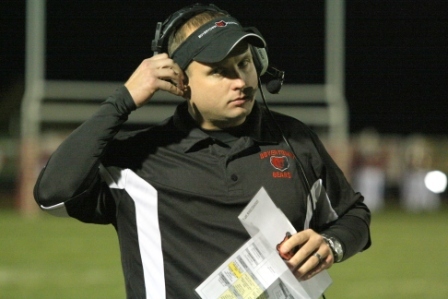 His last stop trumped them all as he piloted the Boyertown Area football program for the last six years. During that time, he flipped a program that was 1-11 in 2007 into Pac 10 Conference Champions in 2010. He set a school record for wins in a season in 2010 and also set school records for every offensive category in 2010, but broke them all again in 2013. With such a great situation brewing at Boyertown, why leave for Northampton? Scisly will have his hands full with a K-Kids football program that has struggled recently and went winless in 2013, but he has been known to be the master of resurrection as he turned both Salisbury and Boyertown from basement dwellers to champions, which he said is something he likes to do and he wants to do it here. Scisly’s hard work has netted a great return thus far as it has landed him his dream job. He hopes the players put in as much work so it pays out in dividends for them, in the form of wins, on the gridiron.